Recommendations: One of my favourite art works is a still life painting called "The Fan" by Emil Carlsen, at the Art Gallery of Ontario in Toronto. It has a kind of quietude and mystery that I aspire to in my work. I love still life paintings for their use of ordinary objects – these are not epic paintings - and the feeling of stillness they embody, the atmosphere of a poised moment. The backgrounds of many still life paintings are as beautiful as the objects themselves, with their complex layers of colours almost dissolving in a mist. I try to visit this painting whenever I am at the gallery and I miss it when it's not on display. 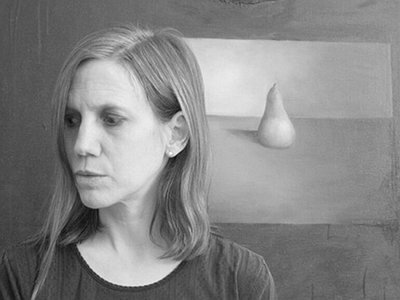 Website / Contact: If you enjoyed this interview with Linda Catlin Smith, her website offers biographical information as well as insightful essays. Also, do check out the videos on the sidebar, which include a beautiful rendition of “The Surroundings” by pianist Cheryl Duvall, at Arraymusic. I grew up with a piano in the house (my mother was a piano teacher), and I learned to read music before I learned to read words. I loved playing around at the piano, making sounds that I liked. I also had a record player in my bedroom and I was allowed to listen to one side of a record (LP) every night before going to sleep. We had all kinds of records, classical, jazz, musicals … I adored Ravel's "L'Enfant et les Sortileges". I loved listening to music in the dark. Whenever I hear something I love, I try to replicate it for myself. It's my way of being able to surround myself with that thing, whatever it is. Sometimes I'm moved by something other than sound, like a certain texture or layering that I see in a painting, or maybe a certain quality of colour or mood, or the way a vine wraps around a branch in the garden. Ideas come from everywhere. Attempting to copy something is my way of teaching myself what it is, while at the same time, it always goes in a different direction than the thing I was trying to reproduce – it leads me down a new road. One of the most difficult things for me to do was to figure out how to put what I was imagining into notation. And the hardest part of that was to get a certain subtlety of rhythm, to take beats and make them irregular, more floating …perhaps the biggest challenge when starting was that I was trying to figure out what I wanted to hear, what was relevant and what was to be abandoned … I found that what helped me was to try to get all of the intimidating voices out of my head – teachers, performers, other composers … and just write for myself. It was a way of intensifying my focus ... painting with one's back to the world, as painter Agnes Martin said. I love my studio. It's in one of the upstairs bedrooms in the house I share with Rick Sacks, my husband. I have a small piano there, and a large desk and too many books and possibly too many recordings. Most of my books are on the visual arts and literature, with a few music books here and there. My studio has some paintings by artists I know, and rocks and objects – it is a bit of a lovely mess. Downstairs in the living room is my grand piano, which I got a few years ago; I do most of my composing there, and most of my thinking and researching in my studio. I love working at the piano; it keeps me inside sound, and in real time, and in the right register … I am the kind of composer who will play something over and over and over until I feel I have it right. My favourite days go like this: after coffee and breakfast, I like to have time in my studio, browsing through recordings, through art books, reading, listening, researching… it is my process of getting ready to work, a kind of preparation. Then I shake off the reverie and go to the piano and start looking at the work I left off with, to see what's there. I work until I need a break, then, if it is summer, I weed the garden, if it is winter I cook something or clean the kitchen or mop the floor. After lunch, I go through the process again, researching, looking, listening, and then go back to the notes. I think the previous answer addresses this somewhat … looking at the work of other artists and writers puts me in a kind of atmosphere of thought that's ideal for working. If I have a work already in progress, I am always curious to go back to it, to see what the material is capable of, to play with it a bit, pondering, rather than committing. I keep things in play for a long time, not scoring until I am really sure. I think curiosity and desire are the main states that I like to be in – I want to see what will become of the material, and I have a genuine desire to hear it … to be inside it, to lose myself; working is a place to be, a state of being. "Les fleurs anciennes" is a work I composed in 2000 in honour of the millennium – it was part of a concert where each piece was supposed to be inspired by a different century, and I was assigned the 14th century. As it happened, at that time I was very interested in the Ars Subtilitas music of 14th century France, so I was already steeped in the idea of independent lines, overlapping melodies, and subtle motions. I tried to keep each line distinct and melodically focussed, while still pushing at slight dissonances along the way. I wanted to get a feeling of subtle and continuous motion. Hmmm, technology … well, I use the computer to create scores when I have finished the composing process. I only make computer scores for works that need separate parts – my piano solos, for instance, are in manuscript, as are several duos. Computers are great for scoring some kinds of music, and for generating parts they are wonderful. I'm very tired of midi sounds – students bring their works to lessons on computer now – so I can barely stand it, though I do feel it is helpful in one regard: pacing. Things usually go by too quickly and hearing a work, even in midi, can help with the sense of how time is passing in a work. Collaborations can take on many forms. What role do they play in your approach and what are your preferred ways of engaging with other creatives, including the artists performing your work? How is writing the music and having it performed live connected? What do you achieve and draw from each experience personally? How do you see the relationship between improvisation and composition in this regard? I see improvisation and composition as two different disciplines. In improvisation the musician composes in the moment, spontaneously, through listening and reacting. In a composed work, there is only the faintest remnant of improvisation, in the moment of performance where a performer's instinct and expertise might cause them to do things slightly differently than in rehearsal (especially a soloist), as they listen to the room, to the instrument, to the audience. In the composition process, improvisation can be helpful in terms of playing with material - the 'fooling around' aspect is so important for loosening up the mind … but composition for me is mostly a very considered reflection on every aspect of the work – the opposite of performing improvisation, where it is in the moment that the heightened awareness brings everything about. Composition is a mode of working that calls for intense scrutiny, questioning, experimentation and a kind of ruthlessness in the process. I want to write music that expands my sense of time, I want to make time larger than it is. I want to suspend moments and elongate them. I want to slow things down, so I can hear everything, and crawl inside sound … to be outside of quotidian experience and inside musical thought. I think with slow music you can have more complex harmony. I always preferred the slow movements in Baroque and Classical music – I liked being able to hear everything, and to be hovering inside a moment. For me, sound includes timbre and pitch and volume and density, and all of these are at the heart of what becomes the composition, they are intertwined. The composition is not something I can separate from the sound. Variations of timbre are ways to give shading and contrast to the pitch material. These can also be the subject – shades of noise, or almost unpitched sounds can be fascinating source materials. To me, all sounds are possible considerations for material. Beneath all of this, a sense of proportion is what might give rise to the composition's overall form in terms of how things change, how long sections might be, how the work unfolds in time. Sometimes I like thinking about fabric – the way we use the word 'texture' reflects this – sound can be like velvet, or silk, it can be rough or smooth, dense or transparent. I am also very inspired by painting – I have studied a few painters quite a lot (Morandi, Turner, Rothko, Agnes Martin). I love to think about layering, and about things like darkness or lightness – shading and highlights. I have had good friends who are painters and I have learned a lot from them. Composing is a way for me to focus myself, while at the same time when I am working I also feel I lose myself. Composing is a challenge, but it is also a retreat or refuge; it has been a form of sustenance for me, a thoughtful engagement as well as a source of deep pleasure. I don't know if we will ever be finished with listening to music in a quiet room, where the musician is playing music for us, in person, in that very moment. I think the experience of live music is still so mysterious in so many ways that I can't imagine anything to replace it -the feeling of sound washing over me, going into my ears, in a space that has just the right kind of reverberation – this can still be an extraordinary experience. I love the very small concert – the salon experience – with 20 people or less, listening together. And I especially love rehearsals, where the focus is so deep. "I want to make time larger than it is. I want to suspend moments and elongate them. I want to slow things down, so I can hear everything, and crawl inside sound."